Sheriff Kevin Molder was elected in 2016 and took office on January 1, 2017. 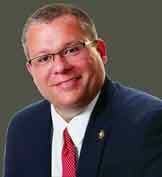 The Poinsett County Sheriff is an elected position and is the Chief Law Enforcement Officer of the county. He is responsible for planning, organizing and directing activities at the Poinsett County Sheriff’s Office and Detention Center. Sheriff Molder began his career in law enforcement as a Detention Officer in 1994. He has remained in law enforcement for over twenty two years. He served over two years at the Harrisburg Police Department where he was a patrol officer. He was an instructor for four years at the Law Enforcement Training Academy in Pocahontas. He has been employed at the Poinsett County Sheriff’s Office for over 16 years where he was a deputy, patrol sergeant, chief deputy, and now serving as sheriff. Sheriff Molder graduated from the Arkansas Law Enforcement Training Academy in 1995. He currently holds a Senior certificate with the Commission on Law Enforcement Standards and Training. He has an Associate of Applied Science in Criminal Justice from Black River Technical College, a Bachelor of Science degree in Psychology and Master of Arts degree in Criminal Justice, both from Arkansas State University. The Chief Deputy works directly under the Sheriff and oversees the daily overall operations of the Sheriff’s Office, which comprises the Administration Division, Patrol Division, and Criminal Investigation Division. The duties and responsibilities of the Chief Deputy are many and varied. One of the biggest responsibilities of the Chief Deputy is coordinating the activities of the various sections of the Sheriff’s Office. This task is very important because it assures that all work and projects are performed by Sheriff’s Office personnel in a manner that will serve to meet the mission statement, goals and objectives established by the Sheriff. Responsible for receiving, maintaining, and tracking all civil process that comes to the Sheriff's Office. These include Orders of Protection, Summonses, Subpoenas, and various Writs. This position also deals with felony arrest warrants from Circuit Court and maintains the Sheriff's Fee Account. Entering and maintaining all Incident/Offense Report. Preparing case files, and the Bonds sheets. In addition, she assists with receptionist and telephone operator responsibilities in the Administration Offices. Connie has worked for the Poinsett County Sheriff’s Office since August 6, 2001.